7/14/2009 – In August there will be a spectacular event celebrating the 200th jubilee of the oldest chess club in the world: the Schachgesellschaft Zürich, which was founded in 1809. Attendees include Kasparov, Anand, Karpov, Korchnoi, Kramnik, Spassky, Ponomariov and Topalov. To prepare you for the jubilee Richard Forster and Christian Rohrer retrace the historical development of the club. In July 1925 Zurich witnessed a unique double event. In its 117th year of existence the venerable Schachgesellschaft Zürich was celebrating the 100th anniversary of its first “national chess tournament”, organised in 1825 in Baden. Simultaneously, the one-year-old international chess federation FIDE held its first annual assembly. The luxurious Dolder Grand Hotel was the splendid backdrop to both events. of the Baugeschichtliches Archiv der Stadt Zürich). The Zurich tournament was the 29th national championship of Switzerland. As in 1909, when he narrowly missed the title, Paul Johner, the Berlin-based international master, was the star of the main tournament. Only a few months previously he had won a master tournament in Berlin ahead of Akiba Rubinstein, Richard Teichmann and Jacques Mieses. Nevertheless, the return to his home country after 16 years exceeded all expectations: by scoring 10 points from 11 games he put no fewer than 3 points between himself and the next-placed player, Fritz Gygli, dominating the championship in a manner never seen before or since. Paul Johner’s success left no doubt as to who was the strongest representative of Swiss chess. Apart from an extra fee, one of his motives for returning may have been hopes of representing his native country in the chess Olympiads – a series of tournaments which had just been initiated by the equally young international federation. However, quarrels about Johner’s status as a semi-professional and monetary compensation eventually led the Swiss federation to do without its best horse over the next decade. In those days it was still quite easy to bring all FIDE delegates together for a photo-shoot. The FIDE congress of 1925 was the first international chess event in Zurich. An innocuous little affair, it was soon to be followed by some spectacular events. When, seven years later, the oldest chess club in the World began preparing its 125th anniversary, the plan to hold an international tournament soon became an idée fixe. Indeed, it was imperative if Zurich did not want to lose face, because when the arch rivals from Berne held the Swiss championship in 1932 they had managed to invite not just three potential world championship candidates (Max Euwe, Efim Bogoljubow and Salo Flohr) but also the World Champion himself, Alexander Alekhine. The only way to maintain Zurich’s number-one position in Swiss chess was to achieve something similar. The masters at Berne 1932 (click to enlarge). At the time it was very difficult to imagine how this could happen, and especially after the economic depression of the early 1930s, which had a strong impact on sponsorship opportunities. Undaunted, the Schachgesellschaft Zürich managed the seemingly impossible. Thanks to good connections and a fair dose of sheer luck they managed to attract not only all four of the above-mentioned world-class players but also Aaron Nimzowitsch. He, by the way, had been a student at Zurich University back around 1906 and had left deep traces in the memory of many an old citizen, even though it remains an open question which left a more profound impression: his phenomenal chess abilities or the equally phenomenal mouth of the 18-year-old youth. 21…Re2+! 22. Qxe2 Nd3 mate. Yet the real sensation of the Zurich 1934 tournament was the return of an even greater figure: Emanuel Lasker. The former World Champion had retired from international chess nine years previously, but many continued to regard him as the best player alive. He had entered the field only at the last moment. In fact, but for the refusals received from several other players invited, his participation would have been impossible. talking to the tournament organiser Fritz Widmann. There is no defence against the onslaught of the black pieces. 48. Qc7 R8d5 49. Re1 Rg5 50. Qxc6 Rd8 White resigned. The 125-year-jubilee tournament of the Schachgesellschaft Zürich was won by the World Champion. 1. c4 e6 2. d4 d5 3. Nc3 a6 4. cxd5 exd5 5. Bf4 Nf6 6. e3 Bd6 7. Bxd6 Qxd6 8. Bd3 Nc6 9. Nge2 0-0 10. a3 Ne7 11. Qc2 b6 12. b4 Bb7 13. 0-0 Rfe8 14. Ng3 Ng6 15. Rfc1 Nh4 16. Nce2 c6 17. Rab1 Re7 18. a4 Rae8 19. a5 b5 20. Nf4 Rc7 21. Qc5 Qd7 22. Re1 Ng6 23. Bf5 Qd8 24. Nd3 Bc8 25. Rbc1 Ne7 26. Bxc8 Nxc8 27. Ne5 Re6 28. e4 Nxe4 29. Nxe4 dxe4 30. Rxe4 f6? Resigning himself to the loss of a crucial pawn. After 31…Kxf7 32. Qh5+ Ke7 33. Rxe6+ Kxe6 34. Re1+ Kd6 35. Qc5+ Kd7 36. Qf5+ the World Champion would have been mated. 32. Rxe6 Qxe6 33. Nd8 Qe4 34. Nxc6 h6 35. d5 Qd3 36. h3 Qd2 37. g3 Kh8 38. Kg2 Qd3 39. Re1 Kh7 40. Re3 Qd2 41. Re8 Qd3 42. Qd4 Qc4 43. Qe4+ Qxe4+ 44. Rxe4 Kg8 45. Nb8 Kf7 46. Nxa6 Rd7 47. Rd4 Ne7 48. d6 Nf5 49. Rd5 Nxd6 50. Nc5 Rd8 51. Ne4 Nb7 52. a6 Ke6 53. Rxd8 Black resigned. Nevertheless, in Zurich Alekhine’s star was still shining brightly, and it was here that he scored his sole win against Lasker. 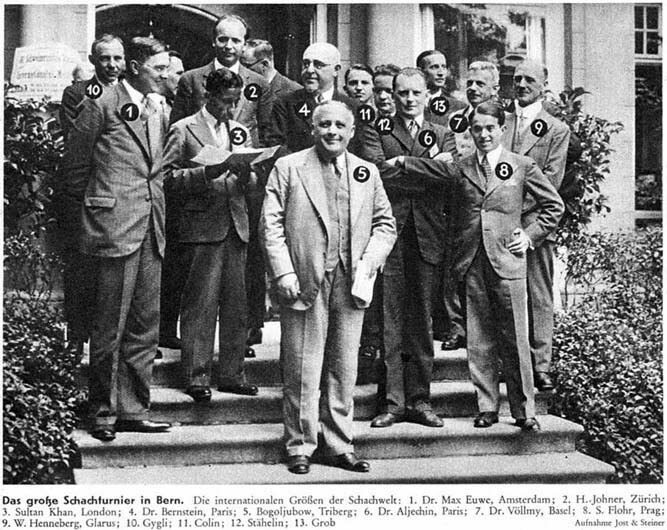 The participants in the international master tournament 1934. As shown by the tournament table, the Swiss masters were powerless against the foreigners. Nevertheless, they had a number of individual successes, such as this sparkling attacking game by Walter Henneberger. After 22. exf5 e4 23. fxe4 Qxe4 White must lose one of his rooks (24. Rhh3 Nxh3 25. Rxh3 Qg2). 22…Re7 23. Kd1 Bd7 24. Kc2 b5 25. Qe1 bxc4 26. Rd2 Ba4+ 27. Kb2 Rb8+ 28. Ka3 Reb7! He can afford to sacrifice the bishop a second time. 29. Kxa4 Qf7 30. Bxc4 Qd7+ 31. Ka3 Qc7 32. Bb3 Qa5+ 33. Kb2 c4 34. Qd1 Qa4 35. Rf2 Rxb3+ 36. Ka1 Qa5 37. Rc2 Rxc3 38. Rhh2 Rcb3 39. Qc1 c3 40. Rhg2 Rb1+! White resigned. The Zurich tournament was probably the most prestigious in the World between 1930 and 1934. It was commemorated by a beautiful tournament book, mainly famous for the expert annotations by Alexander Alekhine. But it also features some of the most humorous and touching round-by-round reports ever written, by the Swiss chess journalist and tournament participant Fritz Gygli. There was a small postscript to the 1934 tournament which has fallen into oblivion almost as much as its protagonist: Erich Eliskases, the aspiring young Austrian master was held on stand-by in 1934 in case of an unexpected withdrawal by one of the participants. He did not have a chance to play then, but as modest compensation he was invited to Zurich twice in the following two years. At Easter 1936 his presence was used for a small training tournament. He won it convincingly, conceding only one draw. Eliskases was the convincing winner of the Zurich 1936 Easter tournament. Hans Johner, who otherwise dominated Swiss chess in the 1930s, was not on form. Nevertheless, he won the following game, which was considered the most beautiful of the tournament. Analysis shows 23. Rxe5! to be even more forcing. 23…Qxf6 24. Rxe5 Qf4 25. Qxf4 Nxf4 26. Bf1 Rc5 27. Rd1 Kg7 28. Nd4 Kf6 29. Rde1 Rf7 30. g3 Ng6 31. Rxe6+ Bxe6 32. Rxe6+ Kg7 33. Rd6 Nf8 34. cxd5 Rf6 35. Ne6+ Nxe6 36. dxe6 Kf8 37. f4 Rc2 38. Rd8+ Ke7 39. Rd7+ Ke8 40. Bb5 Black resigned. Curiously, at move 14 Johner missed a spectacular win which, in yet another Zurich brilliancy, played 65 years later, did not escape Gary Kasparov under very similar circumstances. 18. Bh6! gxh6 19. Qd2 f5 20. exf6 Bd8 21. Qxh6 Ra7 22. Ng5 Qxb5 23. f7+ Rxf7 24. Nxf7 Black resigned. Richard Forster: Schachgesellschaft Zürich 1809 bis 2009. Eine helvetische Schachgeschichte in zwei Jahrhunderten mit einem Personen- und Turnierlexikon. 576 pages, with over 300 illustrations and more than 500 diagrams, games and fragments (in German). Ordering details and an excerpt are available at http://www.sgzurich2009.ch/pages/book.php.